Happy Wednesday friends! Almost to the weekend! I have a couple really big giveaways coming up before the holidays and stay tuned to my Instagram tomorrow or Friday for a good one! HINT: You will want to win to plan for your 4th of July race! But first, I have a fun little start to the summer giveaway for you! Have you noticed that every single thing in Trader Joe's lately is mango? Mango scented? Mango flavored? Well, my favorite product at Trader Joe's used to be the coconut body butter. But now, the mango body butter has taken it's place! And I want to send one of you a tub of it! Details on how to enter further down! That said, on to more GIVEAWAYS! Join me and Erica in the Roundup where all the best giveaways on these inter webs reside. We had 65 giveaways link up last week! So make sure you link up your giveaway and enter to #WinAllThePrizes! Remember, the rules can be found here. No purchase necessary. Void where prohibited. 1 winner will be selected via Random.org. Open to Residents of the US only 18 years of age or older. Must have a non P.O. Box mailing address. Winner must have a valid email address. This giveaway is in no way sponsored by Trader Joe's. I just love it and want to share it! All opinions are my own and I was not compensated in any other way. Okay, so how to enter? Simple! Just comment below with your favorite Trader Joe's product. That's it! I love the sushi at Traders Joes. My all-time favorite TJ project has to be the cauliflower rice! My favorite Trader Joe item? There are so many to choose from!! My family loves the Trader Joe Shrimp Nuggets, but my fave thing to get is their hummus. I love the Trader Joe's Chile lime seasoning. I love Trader Joe's Chile lime seasoning. I love their teriyaki chicken. I'm loving the mango items. My mom is allergic so I didn't get any mango until I went away to college. The mango salads/slaws are fantastic. The mango taffy/ licorice is OK. The mango lemonade, ice cream, and Joe joes are underwhelming. You know I HATE disagreeing with you but I LOVE the mango ice cream! It seems like Trader Joes gets on a theme and won't let go! 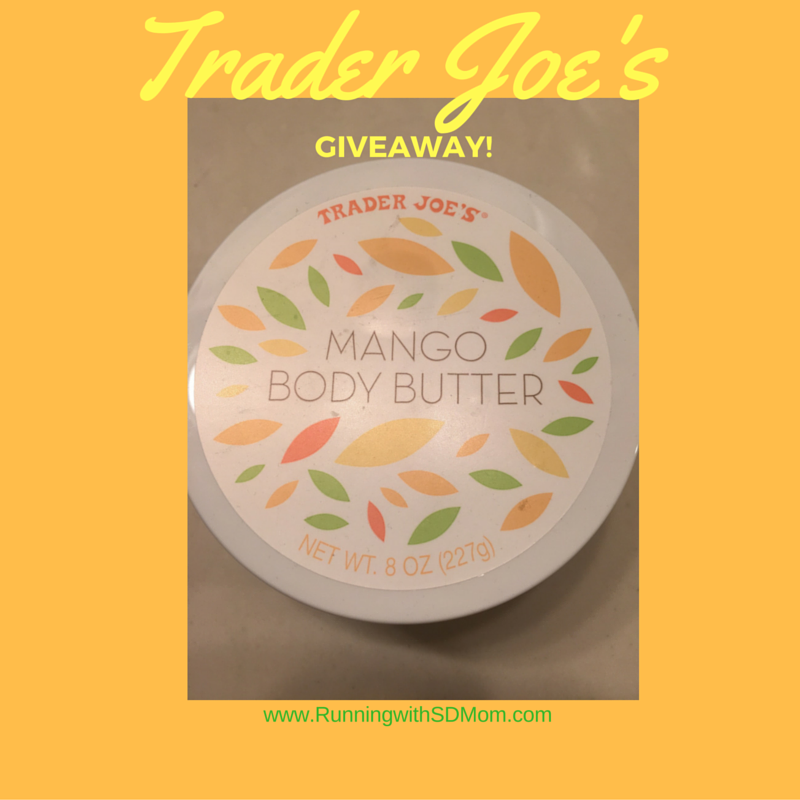 I LOVE their coconut body butter and have yet to pick up the mango but want to try so badly! I like their peanut butter cups. Perfect for PB surprise cookies! They have a really good chocolate cake. I'm blanking on the exact name for it. They also have nice breads as well. What? I have to pick my favorite TJ's product? That's impossible! They have so much good stuff! But ok, here's one; I am a big fan of Speculoos cookies with my cup of joe. YUM! So far, my favorite Trader Joe's product are the frozen veggie mixes. I just made my biannual trip to TJ's recently and noticed EVERYTHING was mango! They told me at the checkout June is "Mango Month" :) I love their masala veggie burgers. Worth the trip every time! There are so many things we love at Trader Joe's. I guess my favorite is the spinach greek yogurt dip. That's so hard to do, I love everything there! An indulgent item I buy are the frozen croissants in almond or chocolate. I love their veggie broth. My favorite Trader Joe's product is the dark chocolate bar. Hard for me to pick just one as they have so many wonderful products, but one of my favorites is the Bacon Cheddar Ranch dip. I love the dark chocolate covered almonds! Congrats! You are my winner! I like the Triple Ginger Snaps. I love Trader Joe’s Dried Fruit, Soft and Juicy Mandarins. I like Trader Joe's 21 Salute Seasoning. "Have you noticed that every single thing in Trader Joe's lately is mango? Mango scented? Mango flavored? Well, my favorite product at Trader Joe's used to be the coconut body butter. But now, the mango body butter has taken it's place! And I want to send one of you a tub of it!" Unfortunately I have a mango allergy, you can know more from http://stopallergyguide.com/mango-allergy/ about it and I'm sure that it's very useful information for everyone! This looks awesome, love Trader Joes products! I love the edible cookie dough! Delish! so many good things i love but my favorite is the chocolate covered pomegranate seeds. I like the Mango Babka. Trader Joe's Organic Surfboard tortilla chips are a favorite. Also the TJ's Organic Cashews. I love the frozen bbq chicken. Great served over white rice for an easy dinner. They have some amazing pasta sauces! Their basil sauce is delish! I've never tried Trader Joe's. If I should win this would be my first product from them.